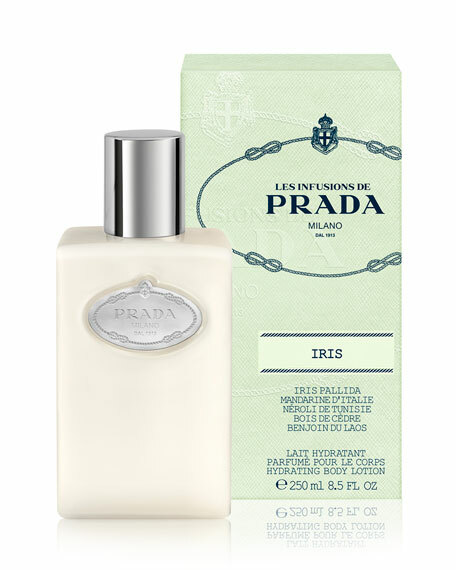 Prada Infusion d'Iris Body Lotion, 8.5 oz. PradaInfusion d'Iris Body Lotion, 8.5 oz. The traditional yet contemporary Prada Infusion d'Iris reinforces Prada's connection to artisan traditions of classic perfumery. A contrast between a great freshness and apparent lightness, and a type of tender veilsensual and strongthat envelops the body and the clothing of the woman who wears the fragrance. It is an intimate and personal scent that envelops you. Les Infusions d'Iris. Avocado oil, shea butter, emollient, moisturize and protect the skin. The glycerin, urea, and allantoin hydrate while regenerating, protecting, and soothing the skin. This delicate, hydrating lotion leaves the skin with a satin touch. It protects and gently hydrates while firming the skin. This delicate, hydrating lotion leaves the skin with a satin touch. It protects and gently hydrates while firming the skin. Enjoying the fresh sensation of Prada Candy lotion is an ultra-feminine experience. 150 mL.